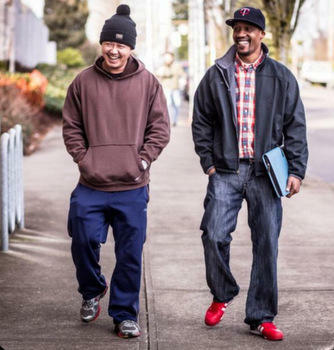 A Justice Reinvestment program combines intensive treatment, wrap-around services, and mentors with community supervision as an alternative to costly prison sentences. In Multnomah County, Oregon, some people who have been arrested are presented with a unique opportunity to positively shift the direction of their lives. Instead of serving years in prison, they may qualify and opt for sentencing in the Justice Reinvestment Program (JRP) - a second chance to stay in our community. To help people with a JRP sentence get back on track and overcome the enormous obstacles in their lives, Moving Forward coordinates a supportive team with a comprehensive menu of housing, mentors, employment, family and treatment services provided in concert with parole and probation services. Surrounding people with healthy connections promotes better decision-making, resulting in drug and crime-free lives. Moving Forward increases public safety locally and cost effectively, and reduces statewide prison use, the most expensive option for our wallets, our families and our future. The Multnomah County Justice Reinvestment Program or MCJRP is a product of House Bill 3194 or 2013 legislation designed to reduce state spending on prisons and reinvest the savings into local counties and their respective community-based programs and services. HB3194 modifies sentencing and reserves Oregon’s prison space for the most serious, violent criminals while dramatically cutting prison costs through investment in local public safety systems. In Multnomah County, it means offenders facing prison for offenses like drug and property crimes, would instead undergo a rigorous evaluation assessing their likelihood to re-offend and their treatment needs. They would then complete a 120-day customized, intensive supervision plan. Wrap-around services aimed at addressing the root cause of crime and reducing recidivism are also set up.